Note : Your request will be directed to DS Instruments. 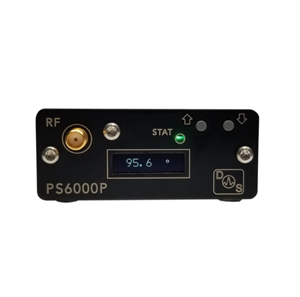 The PS6000P from DS Instruments is an ultra-wideband active RF Phase Shifter that operates from 3.5 to 6 GHz. This handheld stand-alone and remote controlled phase shifter provides a phase shift from 0 to 355 degrees in 5.6-degree steps. It can be controlled via the front panel on the device or via a USB port. This ultra-compact USB device features a graphic display and audio feedback. The phase shifter can handle an input power of less than 25 dBm. It is available in an ultra-compact powder-coated aluminum benchtop case and is ideal for antenna systems, beamforming research, MIMO, LTE and WiFi applications.